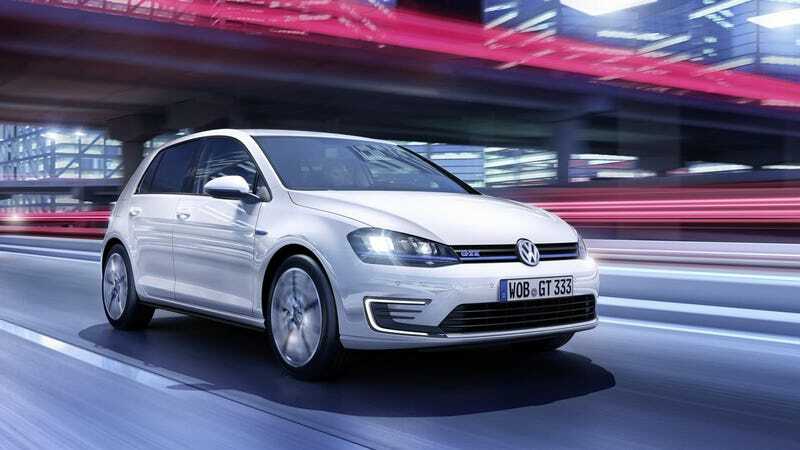 Following on the success of the new Golf GTI and GTD, Volkswagen is introducing an electrified version called the GTE. With a 1.4-liter 148 horsepower TSI engine and a 101 hp electric motor, it gives you a combined power of 201 hp and 258 lb-ft with remarkable mileage. With a top speed of 135 mph and a 0-62 time of 7.6 seconds, The GTE remains slower than the diesel hot hatch but gives you something that no other fast Golf can: An all-electric range of 31 miles (extending the overall range to 584 miles) and a theoretical fuel consumption of 130 mpg combined on the New European Driving Cycle. If you use the GTE in all-electric mode around the city, top speed is decreased to 81 mph. That's more than enough and the 8.8 kWh liquid-cooled lithium-ion battery pack takes only about three and a half hours to charge fully from a conventional wall outlet. Connected to something with a bit more punch, and you're good to go an hour earlier. You'll find the socket behind the VW logo in the radiator grille. The whole package is quite compact. The battery weighs 265 pounds, which is about eight percent of the GTE's 3360-pound curb weight. The electric motor is integrated in the transmission housing of the six-speed DSG. Inside, the tartan remains and the GTE also gets the usual toys of electric vehicles such as the power meter, a 360° range displayed on the map with available charging stations and a the power flow meter informing you about your actual efficiency.